The folks at Real Time Gaming have launched another soon-to-be holiday hit, with Swindle All the Way. This is Jackpot Capital online casino’s brand new game for the month of November, with 5 reels and 25 variable payline, a Free Game special bonus feature, a Minor and Major Progressive Jackpot, Wilds, Multipliers, and so much more to be desired. 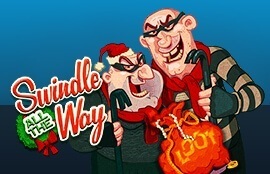 While you help to beat those pesky burglars from robbing all of the Christmas cheer from the good girls and boys, you’ll be pleased to know you stand that chance to trigger two potential Progressive Jackpots! The Scatter symbol (Swindle All the Way logo) pays in any direction and is multiplied by the total bet, potentially sizing up to a fair sum of bonus loot; to be precise, the top award in this thrilling new slot is an impressive 82,500 times your bet! You’ll want to keep your eye on the Scatter, as 3 or more of these logo symbols anywhere on the reels will trigger the Free Games feature. You’ll then see those two burglars we know and don’t love hiding on each reel. If 3 Scatters triggered the feature, one pick is allowed; if 4 or 5 trigger the feature, two picks. You’ll then receive 3, 5 or 10 Free Games depending on the Scatter trigger amount, plus 2, 3 or 5 extra Free Games for each burglar found. You’ll also receive a Prize Multiplier, 1 plus 1 for each burglar found, or 3 plus 3 if 5 Scatters triggered the feature. Lastly, if you retrigger the feature, that’s an additional 10 Free Games! This game is full of holiday surprises and plenty of action; the perfect new slot game to get you in the mood for the holiday season! Available on Mobile, Instant Play and Download, you’ll have the chance to play from home, or while you’re waiting in long shopping lines over the season; it’s a win-win!